The unfortunately titled Run Fatboy Run comes from that risky, murky water where comedians decide they want to be sweeties. Sometimes, this can be golden: Simon Pegg, who stars as the slobbering, unreconstructed-on-the-way-to-construction hero, Dennis, is particularly talented at juggling the flatulent with the heartwarming. However, it's a dangerous idea, as comedians can sometimes get derailed on their way to sensitive, saccharine warmth, and end up in the horribly, gouge-your-eyes-out maudlin. For example, Robin Williams in a number of films (though What Dreams May Come may be the most notorious), or Adam Sandler's nauseating self-pity in the gratingly unfunny Funny People. Adam Sandler's actually a good match for Simon Pegg, as they both specialize in frat boy (or, well, the British equivalent) humo(u)r that is underscored by a genuine authenticity - they are both adept at playing man-children. 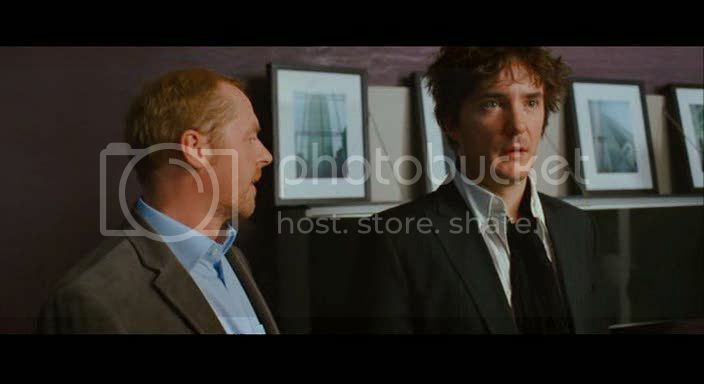 Run Fatboy Run introduces us to Dennis (Simon Pegg) on the day of his wedding: his gorgeous, pregnant bride-to-be, Libby (Thandie Newton), chats with her amiable cousin, Gordon (Dylan Moran), and Dennis? He's the one sprinting down the street, away from the garden party. Fast forward five years and fifteen kilos, and Dennis, now a dumpy security guard, is now sprinting after a (incidentally hilarious!) transvestite shoplifter. He lives in a basement flat, where he is periodically heckled by his (incidentally hilarious) landlord, Mr. Goshdashtidar (Harish Patel, from My Son the Fanatic), for perpetually forgetting his keys. Dylan Moran was very comically spacey as well. When Dennis visits Libby to pick up their son, Jake (Matthew Fenton), he is introduced to Libby's new boyfriend: Whit (Hank Azaria). Whit is everything Dennis is not: a successful hedge fund manager, he showers Libby and Jake with expensive gadgets and affection, is breezily self-confident in a very American way, and runs charity marathons for fun. Dennis, privately, seethes. He decides to remedy his broken heart and dead-end life by challenging Whit to his own marathon. Everyone does a lot of scoffing and snorting with laughter - what, Dennis? the fat guy? a marathon? - and Dennis, meanwhile, with his gambling buddy, Gordon, and Mr. Goshdashtidar, gets down to training. The rest of the film follows the usual course. 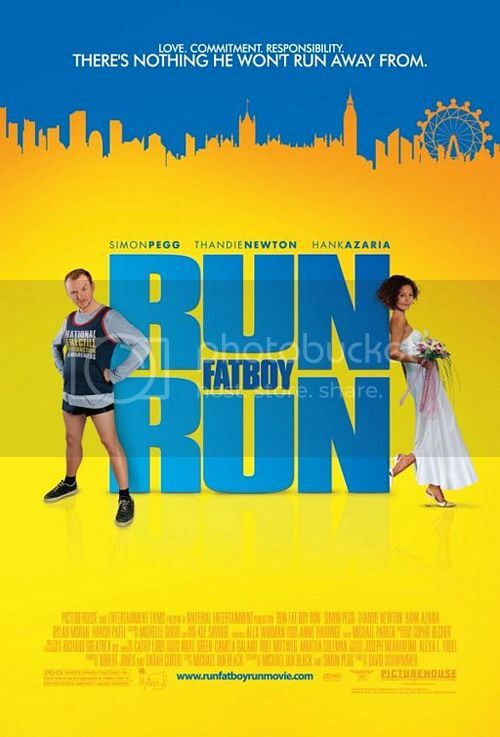 Run Fatboy Run generally avoids some of the disasterous pitfalls which threaten a movie like this, mostly because, as we said above, Simon Pegg has a good handle on balancing sympathy with humor, and we have a very high tolerance for seeing him be sad before we consider it over-the-top and indulgent. We think this is generally because Pegg sparingly uses that most deadliest of comic weapons - irony - and hence never distances himself from the character. Yes, Dennis is a clumsy, Homer Simpson-esque buffoon, but he's also, always, human. Everything is played straight. Example: when Dennis, in usual Disney-style manipulation, momentarily loses his son, there is real horror and panic. It's a credit to Pegg, who specializes in airy comedy that's been deep fried in pop culture, that he is actually a very authentic actor indeed. Then he got a niiiice foot massage. Other cast members, such as Dylan Moran and Harish Patel, have a good ol' time and offer charming support to the central conceit. For the most part, the film succeeds because it feels more like a Nick Hornby movie (we were specifically reminded of About A Boy), though things spiral slightly out of control with the climax, which becomes so sticky with sugar that we had to go wash our eyeballs. All in all, it's not a memorable film and Pegg's characteristic surrealism is missing, but it's a modest and inoffensive heart-shaped fluff piece. We can handle that. Where is the Fat Boy, though? Is Simon Pegg fat? Doesn't seem so in the poster. You put up undiscovered gems.Love your writing. This is a collective though, innit? Banno - Pegg's "fatness" is a lot more convincing when he's in the security guard outfit (I think he's wearing a fatsuit, even). sandman - Thanks! That's music to my ears. And yes, though the collective shares one body.